This Elibron Classics book is a facsimile reprint of a 1887 edition by William Blackwood and Sons, Edinburgh and London. Laurence Oliphant (1829 1888) was a Scotch writer and traveler, Christian mystic, and active supporter of the return of the Jews to Israel. He traveled widely and, from 1865 to 1867, was a member of parliament. During the Russo-Turkish War (1878) he began to take an interest in the Holy Land and Jewish settlement there, in a blending of political, economical, and mystical religious considerations. 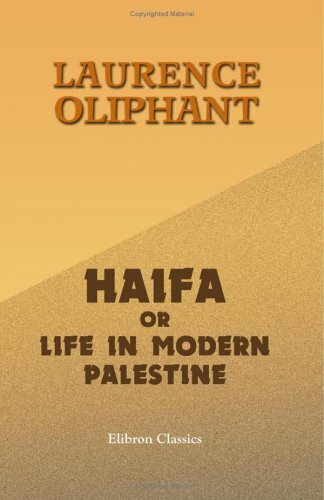 Oliphant eventually settled in Haifa, where he engaged in religious and mystic contemplation. His writings include "Land of Gilead" (1880) and "Haifa, or Life in Modern Palestine" (1887).